← Framing and WIP’s Progress. 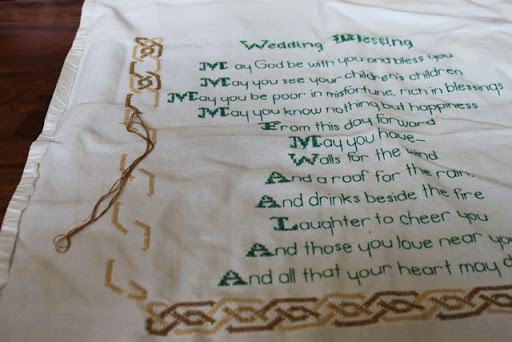 This past week I’ve been working on Enchanting Lairs Celtic Wedding Blessing and I finally see the end and feel like I made good progress. As you know this is for my sister and needs to be ready to return to Australia with her on the 26th of this month so I need to push on now. Here’s a pic as it was at the end of last week. And this is the progress I’ve made on it this week. 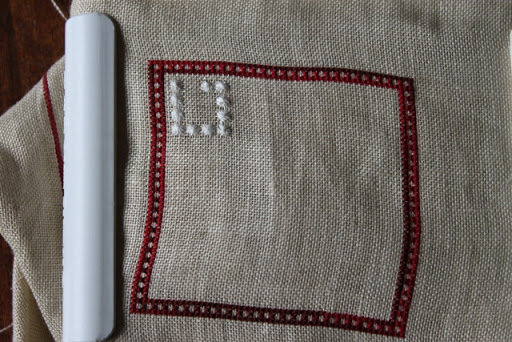 I’ve just one long border to do and then some crosses in the corners done in either beads or kreinik metallics. I’m not sure which and if you want to throw your bit into the mix just let me know in the comment box. The choice is purple and white beads or purple and white metallic threads. My one other update is on my biscornu or what will be one when I get it finished. Its only a small update on last week. I’m really loving this one. I’ve used Belle Soie silks by Crescent Threads. Tulip and Icing to be exact and I’m stitching on a gold linen, not sure which as I’ve lost the package but will find and let you know. 15 Responses to Progress At Last ! Your sampler is looking beautiful. What a lovely wedding gift it will be.Silk threads are just so delicious aren't they! Know your sister will love the beatiful piece. Great stitching. So beautiful. Love the colors on both pieces. 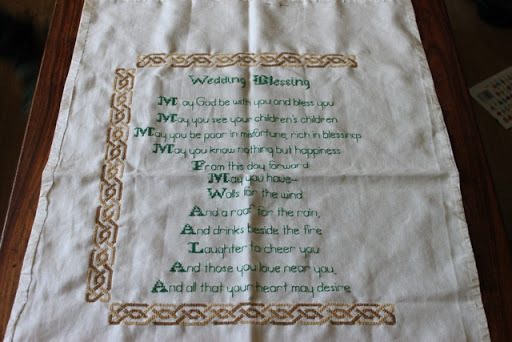 The wedding sampler is wonderful and I'm sure you'll get it done well in time. The biscornu is looking lovely, can't wait to see how it finishes. Great progress!! It is beautiful. Looking forward to seeing the the biscornu come to life. Nice progress on your sampler. You'll be done in no time! Lovely progress and it looks so beautiful. Personally, I would go with beads as that might make it a bit "dressy" considering this is a wedding sampler :)The biscornu is coming up great too. Lovely progress on your WIPs. I'm sure your wedding sampler will be finished in time.